The dramatic rise in the number of IoT devices are improving our lives by giving us access to tailored services to reduce the complexity and confusion in our rapidly evolving world. Now that we have access to this information, we want to receive better insights faster than ever. This sensitive information needs to be secured though, as it provides insights and access to our lives. At Rambus, we address these important issues by creating products and services that secure the data, such as our CryptoManager platform, and provide better faster access to it so that service providers can, through our SerDes and memory PHYs, continue to improve our lives. The IoT ecosystem is extremely diverse, giving many options for service providers, OEMS, and system integrators to deploy their products. This diversity creates a difficult situation for creating an easily accessible yet strong security system to protect IoT endpoints. Our IoT Security Service is designed to work with any OEM hardware or IoT platform to provide security credential management while also performing device security monitoring and analytics to improve service availability. Developing an IoT security solution doesn’t need to be difficult, costly, or cause more pain for Service Providers and OEMs. Our IoT Security Service Client SDK, making the integration as easy as possible and backwards compatible. Once integrated, our service enables a secure connection from the device to the cloud with no other work required by the service provider. In this Frost & Sullivan analysis, the report describes key requirements in the Internet of Things (IoT) security market and presents details of how Rambus addresses these needs through effective, economical and easy-to-deploy IoT security solutions. 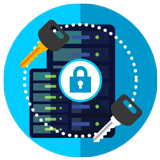 Creating a security platform that is strong but flexible enough to handle hardware and platform changes is time consuming and not cost effective. By working with leading hardware manufacturers and IoT platforms, our IoT Security Service frees up your design space so that you can improve device architectures but still maintain the same level of security without deploying a new security infrastructure. High-speed interconnects are the connecting highway for the internal communications of IoT devices. From video cameras to smart home controllers SerDes and Memory interfaces allow high performance data transfer to keep real time access and updates. Our SerDes, DDR, and HBM IP Cores offer a broad range of flexible solutions for SoC and OEM device designers. The McKinsey Global Institute predicts the IoT could have an annual economic impact of $3.9 trillion to $11.1 trillion worldwide by 2025. With the IoT installed base expected to increase by about 15 to 20 percent annually through 2020, security is simultaneously both a major opportunity and a challenge for the industry. It is therefore critical for IoT data, devices and infrastructure to be protected by a comprehensive security solution (device-to-cloud) that does not disrupt operations, service reliability or profitability. This is precisely why the Rambus CryptoManager IoT Security Service is designed to secure a number of IoT verticals including smart city infrastructure, smart home devices and Industrial IoT (IIoT) equipment.